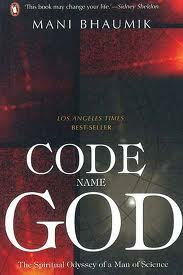 I have been searching a book for the logical defense of God and got a suggestion to read this title. Authored by a laser scientist (physicist) settled in the USA, an Indian by birth Mani Bhaumik, the book is very much engaging. He is the co inventor of LASIK – a surgical procedure for eye surgery. The first half of the book is more autobiographical however the later half tries to answer on the existence of the super power which we generally call as ‘God’. The role of his parents in his bringing up seems to have played an important role in developing an inquisitive mind and the quest for queries. His interactions with Gandhi and some of the great scientists of the time are seemed to have enthused a great sense of spiritualism in him. The story of rags to riches is quite aptly suited with the personality of Mani as he came from a poor rural background. The journey of Mani as narrated in the book is quite interesting and engaging as he is born in a family which lived in rural Bengal and took very active part in India’s independence. The interactions and experiences of his family with Gandhi and other freedom fighters is quite inspiring. The spiritual odyssey as narrated by the author through the book makes a good case of an existence of a super power. This super power is named as God by many. The experiments in the physics lab and the study of star galaxies and their movements do leave one with astonishment and an amazing sense as to the miracles of nature. The colors of flowers and insects, the habits of animals and plants, the chirping of the birds, the shifting of climate, blowing of wind, flow of river, etc etc are similar such existences which really gives me an elated sensation that there is nature. This was a motivation for finding out the reason as to the existence of God with a strong belief in Nature. The scientific defense is well made in the book with full dose of Quantum Physics, which is quite alien to me as a student who does not understand the wonders of science specially the theories behind. The book is a good read for all and specially for those who are interested to link science with God in whatever avatar he is worshipped and revered.